There was a time when rugby was a small candle, but now, like a wildfire, rugby has spread to over 40 players for their upcoming season. Rugby is a contact sport with similar end goals as football, but longer plays and different ways of scoring. What made this spark ignite? Recruiting with the message of what boy’s rugby stands for according to coach Tracey Davies. “The coaches and my expectations each season are to introduce LHS students to an outstanding sport that embodies sportsmanship, honor, discipline and camaraderie,” Davies said. 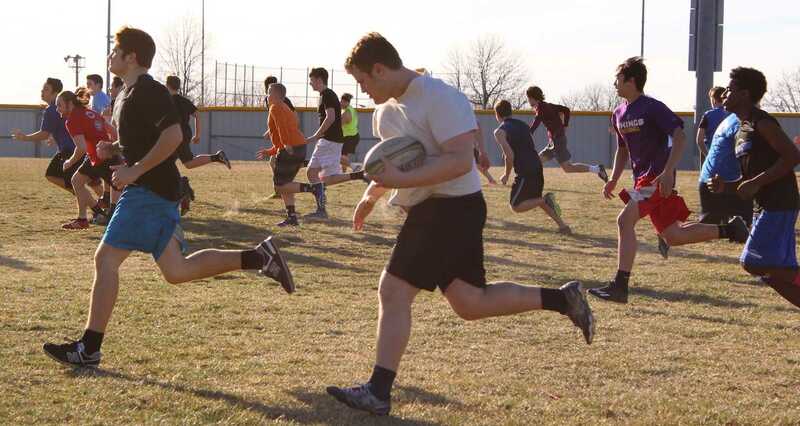 There will be learning curves with so many new players, which has added some extra anxiety along with a hope for the rebuilding of the team and experience that was once paired with Liberty North. “Liberty and Liberty North boys program split in the spring of 2015 so we have been working to rebuild our level of experience on the Jays since then. I continuously remind [the new players] that right now, it seems like I am speaking Greek to them but to have confidence that we will help them figure it out,” Davies said. However, through pre-season preparation and the team’s focus on brotherhood, what may make some timid for their upcoming season, is making other players excited. “We all need to help out the new players instead of acting better than them. We are all on one playing field,” senior Isaac Leff said. Last season, they took seventh at state. While this wasn’t what they wanted, they are preparing for a second chance at a higher place with practices and outside workouts to achieve their new goal for state. The team practices Monday, Wednesday and Thursday 4:15-6:15. With any team there is a level of commitment required to achieve any goal. The rugby team shows commitment through their self proclaimed brotherhood, which comes with support and respect for one another. “One of my favorite parts of rugby has always been our focus on the team and family aspect of the game. Building a positive team culture of unity and brotherhood is high on our list of priorities,” Davies said. All things combined, the team has a positive outlook for their upcoming season. With preparation and desire for a positive outcome, nothing can beat the feeling of actually being on the field and taking part in a sport they love. “There is nothing so thrilling as the ball in hand and nothing in front of you but field,” junior Ben Gale said.